The Federal Occupational Safety and Health Administration (OSHA) Hazardous Waste Operations and Emergency Response Plan under 29 CFR 1910.120, adopted by the Commonwealth of Virginia, was promulgated to ensure that all employers develop an emergency response plan to cover releases of or substantial threats of releases of hazardous substances. The purpose of this plan is to minimize hazards to employees, the public, and the environment from fires, explosions, or any unplanned release of hazardous material to the air, soil, or water. In order to comply with federal requirements, this written plan has been developed for the Virginia Institute of Marine Science (VIMS)/School of Marine Science (SMS). All divisions, departments, and work centers within the VIMS/SMS are included within this plan. All VIMS/SMS personnel are strongly encouraged to become familiar with the contents of this plan. Copies may be obtained from the Office of Safety and Environmental Programs. They are also available for review in each Department or Work Center Office, the VIMS/SMS Library, and on the VIMS web page at http://www.vims.edu/admin/safety/Emr-rsp.html. The plan has been written specifically for the Gloucester Point facility of the Virginia Institute of Marine Science/School of Marine Science. VIMS/SMS also has a facility in the town of Wachapreague, Virginia. It is the responsibility of the Director of Eastern Shore Laboratory to amend this plan as appropriate for implementation at that facility. Furthermore, the Director of the Eastern Shore Laboratory must contact and inform both the Director of Safety and Environmental Programs as well as the Associate Dean of Research and Advisory Services of chemical or hazardous materials spills or incidents as soon as possible, preferably while the incident is in progress. This plan covers all faculty, staff, students, contractors, and visitors who may become directly or indirectly involved in any hazardous materials incident or accident in the work area. This includes receipt, packaging, transport, use, disposal, or emergency response and cleanup activities, under normal or emergency conditions. This plan is to be consulted primarily by the VIMS/SMS Emergency Response Coordinator (ERC) and the VIMS/SMS Emergency Operations Center (EOC) Director; however, all personnel involved in the handling of hazardous materials should be familiar with the contents of this plan. Develop, coordinate, maintain, and implement the VIMS/SMS Hazardous Materials Emergency Response Plan. Schedule and conduct an annual drill designed to exercise the components of the VIMS/SMS Hazardous Materials Emergency Response Plan. Function as the VIMS/SMS Emergency Response Coordinator (ERC) for all hazardous materials incidents within the VIMS/SMS geographical areas of responsibility. Serve as the VIMS/SMS Emergency Operations Center (EOC) Director. Designate the requisite EOC staffing necessary to manage a hazardous materials incident. Provide logistical support as required to support any ongoing hazardous materials incident. The plan has been written specifically for the Gloucester Point facility of the Virginia Institute of Marine Science/School of Marine Science, VIMS/SMS also has a facility in the town of Wachapreague, Virginia. It is the responsibility of the Director of Eastern Shore Laboratory to amend this plan as appropriate for implementation at that facility. Furthermore, the Scientist-in-Charge of the Wachapreague Facility must contact and inform both the Director of Safety and Environmental Programs as well as the Associate Dean for Research and Advisory Services of chemical or hazardous materials spills or incidents as soon as possible, preferably while the incident is in progress. The contents of this plan shall constitute the basic pre-emergency plan for VIMS/SMS and shall be augmented by the Commonwealth of Virginia Emergency Operations Plan, the Gloucester County Emergency Operations Plan for Hazardous Substances, and other technical resource publications as required. The VIMS/SMS Emergency Response Coordinator (ERC) has been designated as the point of contact for coordination with outside parties for planning and executing hazardous materials operations or drills and for representing the interests of VIMS/SMS with such outside parties as the Local Emergency Planning Committee (LEPC). The VIMS/SMS Public Relations Officer shall serve as the point of contact for all media agencies and provision of information relative to any ongoing hazardous materials training evolutions or incidents. The Public Relations Officer will coordinate the information released with the Emergency Operations Center Director. The roles of the ERC, EOC Director, Director of Facilities Management, and the Public Relations Officer are outlined above. All others will be as assigned by the EOC Director. The ERC has the authority to order the immediate evacuation of any building or area in the event of a life threatening situation. For a potentially life threatening situation that may require the evacuation of a building or area, the ERC will consult with the Dean and Director or his or her designee prior to ordering evacuation. The EOC Director has the authority to direct VIMS/SMS assets and personnel as necessary during an emergency situation. Unless outside assistance is required the VIMS/SMS EOC Director or the ERC shall manage the incident and provide requisite notification to outside authorities. Upon request for outside assistance and activation of the incident command system, control of the incident shall pass to the senior fire officer responding in accordance with Section 27 of the Code of Virginia. The VIMS/SMS EOC/ERC will ensure continued support is provided to the Incident Commander. The VIMS/SMS EOC may be activated to support oil spill operations in any geographical area. At such times the EOC Director or the ERC shall serve as the point of contact with outside agencies. In the event of a VIMS/SMS generated oil spill, management and command procedures as outlined above for hazardous material incidents shall be applicable. Emergency communication requirements will be satisfied through the VIMS/SMS telephone console and the Gloucester County Emergency Services dispatch radio system. Normal hours for the console are 8:00 a.m. through 5:00 p.m., Monday-Friday. Additional personnel to ensure continuous operation during an emergency will be assigned as required. The Gloucester County Emergency Services dispatch radio system is operated continuously. On-scene communication for the fire and rescue services will be via the fire ground and state rescue mutual aid channels as appropriate. Appendix 1 is a list of emergency contact telephone numbers. Depending on the circumstances surrounding a hazardous materials incident, it may or may not be readily apparent what the material is. In the event the incident is caused by the failure or dropping of a container of which the content is known, the time required to mobilize effective emergency assets would be less than that needed if the response is directed to an unknown or unidentified material. Emergency recognition procedures for a spill or leak of unknown origin will be conducted from the maximum possible distance. Attention must be paid to any down victims in the vicinity, vapors, wind direction, gradient of land, dead animals and birds, chemical placards, containers with identifying labels that are visible with or without the aid of binoculars, and the type of vehicle involved, if any. If the material cannot be identified without approaching the product, the area will not be entered until arrival of personnel with appropriate personal protection equipment. Prevention of accidental spills requires the utmost attention to proper handling procedures by the user. The VIMS HAZCOM Training Program stresses the importance of handling hazardous material correctly and ensures that the required Safety Data Sheet (SDS) is available for every hazardous chemical or material used by VIMS/SMS personnel. Safe distances for isolating or evacuating unprotected personnel from an area involving a hazardous material will vary depending on whether or not the material is on fire, has vapors which behave like poison gases, or, is in such a liquid quantity that the immediate area is in danger of being contaminated by runoff which would prevent delayed evacuation. The minimum isolation distance is 50 feet and the minimum evacuation distance is 150 feet. The maximum downwind evacuation distance will be evaluated and readjusted as necessary as soon as more definitive information about the material is available. Isolation and distances will be determined in accordance with Emergency Response Guidebook (ERG) protocols upon identification of hazardous materials. Due to the number of buildings on the VIMS/SMS campus which contain hazardous materials and chemicals, places of refuge will be designated by the EOC Director, ERC, or Incident Commander depending on nature of the incident as specified in paragraphs III B and C at the time of evacuation in order to preclude having to re-evacuate personnel from an area of refuge. Continuous reassessment of conditions at the scene will be necessary in order to respond to changes in wind direction, discovery of unexpected victims, or other conditions which may have an impact on the initial isolation and evacuation parameters. Therefore, sheltering-in-place may provide a better alternative if the involved building can be closed up tight and the ventilation system can be shut down. If sheltering-in-place is chosen, it is important that communication be maintained with competent persons inside the building so they may be advised about changing conditions. If there is any possibility of fire or explosion, persons sheltered-in-place must be warned to stay clear of windows in direct line-of-sight of the spill because of the potential danger from glass and projected fragments. Initial site security and control responsibility rests with the ERC until the arrival of the designated Incident Commander. Prior to the arrival of trained emergency personnel, the ERC may utilize any available VIMS/SMS personnel to assist in keeping the incident site isolated. If an incident occurs at a time when a security officer is on campus, that person shall be delegated the initial task of managing site security. VIMS/SMS employees and any on-site visitors will be provided with specific evacuation route directions upon exiting the affected area. If evacuation or sheltering-in-place of any adjacent public facilities or private residences is deemed necessary, this information will be conveyed to the Gloucester County Sheriff’s Department which will take the necessary actions. Under no circumstances will any VIMS/SMS employee or visitor be permitted to reenter any area which has been ordered evacuated until clearance to do so is granted by the EOC Director or the ERC. Routes of evacuation will for the most part be dependent on the location of the incident. In general however, the campus is divided into core and boat basin areas. Egress routes from the core area will depend upon which side of route 1208 is affected and whether or not route 1208 can be used as an exit corridor. Personnel on the river side of route 1208 may be directed to use the beach to exit northward through the residential area or southward via Gloucester Point Beach through the boat basin and up the pathway on the North West side of the Coleman Bridge approach. Personnel on the Route 17 side of Route 1208 may be directed to exit onto Route 17 and then proceed either North or South as required. In the event of a hazardous material incident in the boat basin, every effort will be made to get all non-contaminated vessels underway with the maximum allowable passenger load onboard. The type of decontamination required and the responsibility for effecting sampling will depend on the amount and type of chemical or material involved. Small scale decontamination efforts involving only the ERC, Safety Office personnel, and other designated individuals will be handled in accordance with the appropriate stations defined in Appendix 2 of this plan. All other decontamination efforts will be in accordance with Abingdon Fire Company protocol. Emergency medical treatment and first aid will be provided by the Abingdon Volunteer Rescue Squad as the emergency medical services agency with responsibility for the geographical area that includes the VIMS/SMS campus. The average response time to VIMS from the rescue squad's headquarters is about 3 minutes. Every telephone at VIMS has an label which tells users how to report an emergency or call for medical assistance. The ERC will direct placement of the ambulance to ensure the unit does not come in contact with contaminant either in the form of product or through the loading of a contaminated patient. The safety of rescue squad personnel and the non-contamination of the ambulance take priority over the patient. Rescue squad personnel have been instructed not to begin treatment and/or transport until directed to do so by the VIM/SMS ERC or the senior Rescue Squad Officer/Technician on the scene. Requests for additional medical personnel/ambulances will be the responsibility of the ERC until such time as a Medical Sector Officer is functioning under the Incident Command System if activated. It shall be the responsibility of the ERC to ensure that a copy of the appropriate SDS Sheet is provided to the on-scene medical personnel prior to the initiation of any medical treatment. Alerting of personnel inside VIMS/SMS buildings must, in view of the age and diverse configurations, be handled in a variety of ways. In buildings which have a central fire alarm system, that method will be used to signal evacuation. In older buildings without central fire alarms, it will be necessary to rely on direct person-to-person communications. In either circumstance, each section supervisor or the next senior person, must ensure that all persons have exited and have been directed to a safe exit. In order to preclude the inadvertent exit into a "hot zone" or contaminated area, the ERC will utilize any available VIMS/SMS personnel to direct exiting persons to safe areas. In addition to these measures, for campus-wide emergencies, all personnel will be notified via campus-wide telephone broadcast system (RAVE) as well as through a campus wide speaker system. Name and telephone number of the person making the report. Name and address of the facility where the spill has occurred. Time and type of incident (e.g. chemical spill, fire, etc.). Name and quantity of material(s) involved, to the extent known. Extent of injuries, if any. Possible hazards to human health or the environment outside the facility. Appendix 3 provides information that will assist in the preparation of the above report. The VIMS/SMS ERC shall respond to all hazardous chemicals or hazardous materials incidents of any nature which occur on or are associated with the Gloucester Point campus and may respond to incidents at the Wachapreague Facility if such action is warranted. Response to the Wachapreague Facility will be coordinated with the Associate Dean of Research and Advisory Service and with the Director of Eastern Shore Laboratory at Wachapreague. State or local Emergency Services procedures shall be followed by all outside agencies responding to an incident at VIMS/SMS. It is imperative that detailed records and logs be kept throughout any type of incident in order to ensure that all required measures and procedures are put into effect during and after the incident, in addition to providing data for any required after incident reports. When possible, computer record keeping shall be employed. All handwritten records and logs shall be entered into the computer log system every 2 hours. Depending upon the specifics of the incident, any and all written materials and notes may be considered official documents and should be kept in a secure place and not destroyed. After incident follow-up shall be in accordance with the federal, state, and local regulations governing the type of incident, the material or chemical involved, the extent of damage to the environment, and the consequences on the health effects on humans. The selection and use of personal protective equipment shall be in accordance with the chemical specific recommendations established by Emergency Response Guide, Safety Data Sheets, etc., as appropriate. A limited amount of emergency equipment is available in the Office of Safety and Environmental Programs. Some spill containment materials are available in other locations on campus. A spill control boom is stored in a trailer in the boat basin. The VIMS/SMS ERC and the staff the Office of Safety and Environmental Programs must maintain currency as specified in 29 CFR 1910.120 for the handling of hazardous materials in addition to any other site specific certification requirements. Training in the implementation of this plan will be conducted yearly either in the form of a field exercise or a table top drill. The several appendices to this document contain additional information pertaining to specific groups or problems. Some of the material in the appendices is dynamic in that it changes with time, hence persons using the lists of points of contact, materials, etc. should be aware that some specifics might have changed. The Office of Safety and Environmental Programs will attempt to keep the document up-to-date. Review of this plan will be coordinated by the ERC yearly through a formal request for comments from internal and external holders of the plan. Emergent changes that cannot be held until the annual review due to their potentially adverse impact if not promulgated in a timely manner shall be distributed as necessary. Emergency communications will be handled through normal channels, usually the VIMS/SMS telephone console and the Gloucester County Sheriff/Fire/Rescue radio dispatch system. The VIMS/SMS telephone console usually is staffed between 8:00 a.m. and 5:00 p.m. Monday through Friday on days VIMS/SMS is open for business. During an emergency response, additional staff will be assigned to ensure continuous operation. The staff of the Office of Safety and Environmental Programs can be contacted by cell phone as noted below. The following list of telephone contacts is as accurate as possible at the time of publication but the user should be aware that individual task assignments and telephone numbers are subject to change. All VMS/SMS staff below can be contacted by the Telephone Console Attendant. B. CHEMTREC (emergency information only): 800-424-9300. C. Coleman Bridge Tender: 757-898-8516. D. Compressed Gas Association: 703-788-2700. F. National Response Center: 800-424-8802 or 202-426-2675. J. Riverside Walter Reed Hospital Emergency Room: 804-693-8899. K. U.S. Coast Guard - Milford Haven (24 hours/day): 804-725-2125. Details of situation will be relayed to on-call DEQ, HAZMAT, Search & Rescue and local personnel. O. Virginia Marine Resources Commission: 757-247-2200. Contacting vapors, gases, mists, or particulates in the air. Being splashed by materials while sampling or opening containers. Walking through puddles of liquids or sitting or kneeling on contaminated soil. Using contaminated instruments or equipment. Thorough and efficient decontamination is essential for successfully managing a hazardous materials incident. The scope and methods of the necessary decontamination effort will be determined for each situation by the specific chemicals involved, the size and nature of the releases, and the number of people affected. Different methods exist by which decontamination can be accomplished. The choice of the most appropriate method for a given situation depends on the specific nature of the hazardous materials involved. In some situations, only a single method is needed. In others, a combination of methods should be used. Techniques that are useful for removing contaminants from equipment may be hazardous to exposure victims. Brushing off and wiping away visible contaminants are two fast and effective ways to begin the decontamination process. Mechanical removal of contaminants is particularly useful for removing solid contaminants such as dusts and powders. It also can be used to remove liquids; rapidly wiping spilt acid off the skin with a cloth decreases the severity of the burn caused by that acid. This method poses the risk of depositing contaminants on the ground and may also cause dusts to become airborne and spread to other areas thereby exposing new victims. The most widely used form of decontamination is washing with water, which removes the contaminant while diluting it. Generally, dilution with water is the safest means to remove contaminants from a victim. Other solutions (such as saline water and Ringer's lactate) serve as well, but the ready availability of water makes it the first choice. There are, however, a few chemicals for which water irrigation is not an appropriate method of decontamination. Water-reactive metals such as sodium and lithium produce heat and alkali that can cause thermal and chemical burns after contact with water. Persons exposed to these metals should not undergo water washing for decontamination. Some chemicals are insoluble in water; therefore, while water irrigation might remove them from exposed skin there is no dilution. In such cases, the addition of soap or mild detergent often makes an effective decontamination solution. In some cases, specific solvents such as isopropyl alcohol are useful for decontaminating human victims. This decontamination method is used for removing chemicals from equipment and from the area around a spill. It has no role in the immediate management of exposure victims. Numerous absorbent materials, ranging from sand and soil to specially made compounds, are available. They are especially effective for active spill control and site cleanup as they prevent contaminants from spreading. It is possible to perform decontamination by altering a chemical's structure and converting it into a harmless compound or one that is more easily washed away. This technique is widely used for decontamination of equipment but has little, if any, value in the management of exposure victims. Neutralization of an acid by application of an alkali solution will produce a (harmless) salt; however, the process of neutralization often yields enough heat to cause thermal burns. Once a contaminating hazard has been contained, it usually must be removed from the site of the spill. Following absorption, the absorbed contaminants should be packaged carefully and removed to a disposal site. Wash water used for chemical dilution should not be allowed to run off and carry chemicals into the soil or sewer system; it should be collected for later disposal in order to avoid spreading contamination beyond the spill site. Isolation and disposal play no direct role in decontaminating exposure victims. The decontamination needs of a hazardous materials incident are largely determined by the materials involved. Chemicals should be researched in appropriate references to be sure that all health, reactivity, and flammability information has been obtained. Information about health risks and decontamination needs must be promptly transmitted to the decontamination team. It is important to know whether the chemical is water soluble, whether it can be absorbed through the skin, and whether it accumulates in the body or in the environment. The size of the incident determines the scope of the decontamination efforts. With only a single victim and when little likelihood that rescuers will become exposed exists, a simple decontamination setup such as a shower stall may be all that is needed. Conversely, it may be necessary to decontaminate a number of victims and a larger number of persons who will need decontamination. Any rescuer or other person who enters the contaminated area will require decontamination on the way out. Emergency services and/or personnel must be assigned to supervise and carry out decontamination. Therefore, the size and scope of the decontamination setup is limited by the available personnel. The number needed will be determined by the nature and size of the incident as will be the quantity of equipment and supplies required. The following list is a guideline for needed resources. Selection of the decontamination site is one concern. The site should be upwind from the contaminated area and, when possible, located at a higher elevation than the contaminated zone in order to allow uncontained washing solution run-off to flow toward the area of contamination and not into clean areas. The incident may pose a threat to sources of drinking water and open running water. Environmental conditions also can pose risks to victims and rescuers. During freezing weather it may not be safe to perform out-of-doors washing of contaminated persons. It may be necessary to conduct decontamination at an off-site location or inside a dedicated vehicle or structure. In such a case, transportation of victims to the decontamination site and subsequent decontamination of the transport vehicles must be carried out. Decontamination will be carried out in a series of stations that begin at gross decontamination and end at the EMS treatment area. Each station will employ its own decontamination personnel. The level of contamination at each should be less than at the previous station. Personnel should not move back and forth from higher to lower contamination areas without passing through decontamination. This guideline will help prevent contamination of the decontamination stations. Decontamination personnel must pass through the decontamination process prior to exiting the decontamination area. Victims will be transported from the contaminated (hot) zone to the gross decontamination site by members of the entry team. Victims must pass sequentially through all decontamination stations, failure to do so risks contaminating the entire system. One exception to this rule occurs when a victim also suffers a life threatening condition for which immediate medical attention is required. In that situation, victims can be transported to a definitive medical care facility after only gross decontamination. The EMS personnel, however, must be protected with appropriate personal protective equipment and the hospital must be prepared to treat a contaminated, critically ill patient. Following transport of the victim, the crew and ambulance must undergo decontamination before accepting another patient or physically interacting with other persons. Figure 1 is a decontamination site plan that is typical of decontamination procedures that have been used at oil spill or chemical incidents. At a large incident, each station might be physically separate. At smaller incidents, several of the stations may be combined. Each station is separated by a distance of about three feet. This decontamination facility can be set up in relatively short time. All required equipment is maintained at the Office of Safety and Environmental Programs. Table 1 outlines the action(s) to be carried out at each station and is keyed to the area's and step's of Figure 1. Full body washing is performed in step 3 at wash station 2. Soft scrub brushes or sponges and mild soap or detergent should be used. Special consideration must be given to hair, groin, skin folds, and nail beds. Copious water rinsing should also be performed. Towels and sheets can be used for drying off the entire body. A change of clothes will be supplied at this station. When possible disposable coveralls will be made available. Because of time and expense, most hazardous materials and emergency response teams act in only an advisory capacity during cleanup as do state and local pollution control agencies. Arrangements for cleanup and disposal of contaminated items (including soil) will be made with a private contractor who specializes in this area if the scope of the required clean-up exceeds the capabilities of the Office of Safety and Environmental Programs. The last step in the resolution of a hazardous material incident is debriefing. As soon as possible after the incident, all participating persons will be informed about the chemicals involved and their long and short-term health effects. Medical surveillance scheduling will be established for eligible personnel. 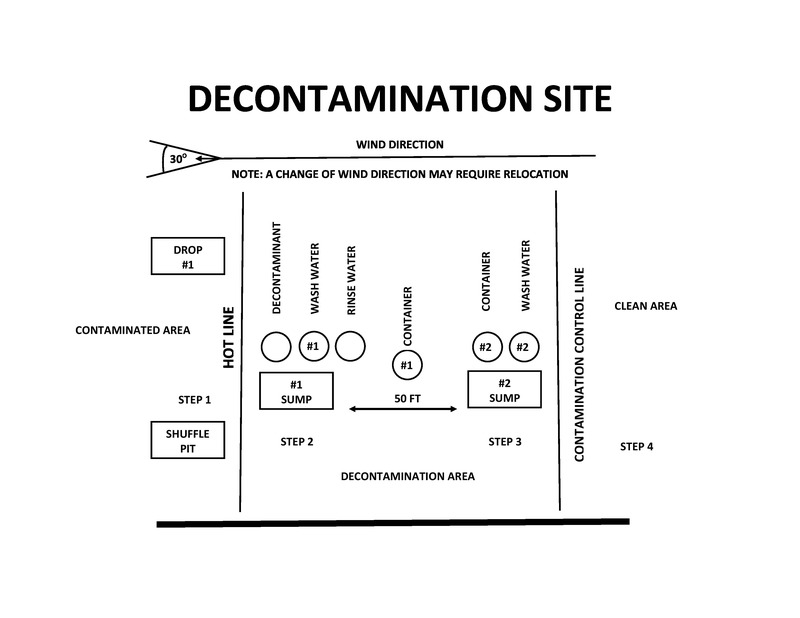 Figure 1: General decontamination site plan. 1. Ground Cover: To prevent contamination of area and to funnel spilled materials into sump. 2. Container of Decontaminant: Pit, box, tub, etc. large enough to allow personnel to stand in while being brushed, sprayed, or wiped with decontaminant. 3. Container of Material To Remove Decontaminant: Pit, box, tub large enough for personnel to stand in for scrub, spray, rinse (if compatible, this is usually soap and water). 4. Container of Rinse Agent: Pit, box, tub large enough for personnel to stand in while being rinsed. 5. Sump: Collection pit or vessel designed to capture and contain contaminated materials used in initial decontamination. 6. Container for PPE Collection and Disposal: Usually a sealable container such as a drum or plastic bag. 7. #2 Ground Cover: To capture small amounts of contaminants and to funnel spilled wash/rinse materials to a sump. 8. Container for PPE Collection/Disposal/Respirator Collection: Used to collect/clean PPE. 9. Wash Station: Used for soap and water personal clean-up/shower. 1. Place equipment/tools used within the contaminated zone here that will not be decontaminated at Drop #l.
2. Remove gross contamination in the shuffle pit. Scrape boots/outer gloves/outer clothing (may remove boots,outer gloves, outer clothing). 1. Enter container of decontaminant for attendant to begin decontamination (spray, brush, rinse). 2. Enter second container for wash down for removal of decontamination agent. 3. Enter rinse container for rinse. 4. Remove next layer of PPE and place in container (respirator remains on). 5. Proceed to next station. 1. Take deep breath. Remove respirator and place in collection container. 2. Rinse head and upper body. Resume breathing. 4. Proceed into clean area. 1. Dress in clean clothes. 3. Food and drink as necessary. The Virginia Institute of Marine Science (VIMS)/School of Marine Science (SMS) is tasked in Appendix II to Part V of the Virginia Emergency Operations Plan, Annex I-U to Volume II, Oil and Hazardous Materials Emergency Response Plan, to participate in initiatives to ensure continued capability within the Commonwealth to respond to an oil or hazardous material incident and under such as taking should 1) Assist in the development of technical scientific support for oil and hazardous material spills in the tidal waters of the Commonwealth, 2) Provide advice and guidance to decision-making authorities to establish policy on use of dispersants and other methods of dealing with spills, and 3) Develop and maintain, in conjunction with the Council on the Environment, Department of Agriculture and Consumer Services, Department of Forestry, Department of Health, Department of Waste Management, State Water Control Board, Virginia Marine Resources Commission, and other institutions of higher education, a data base on the effects of oil and other hazardous materials on commercial and noncommercial living resources. The purpose of this appendix is to provide a consolidated basic reference source and decision making tree to assist the VIMS/SMS Emergency Operations Center (EOC) Director and the VIMS/SMS Emergency Response Coordinator (ERC) in the event of a spill or a request to provide assistance to another agency. VIMS/SMS supports resource management agencies through a program of directed marine science research and advisory functions. In addition to its research activities, VIMS/SMS conducts surveys of the estuarine fish and benthic populations and periodic inventories of tidal wetlands, submerged aquatic vegetation, and conditions along the tidal shorelines of the Commonwealth. Through these activities a substantial data base has been developed that can be brought to bear when a spill occurs. Persons have been identified on the basis of administrative function and technical expertise to ensure continued capability to respond to oil and hazardous materials incidents and for a VIMS/SMS 24-hour-a-day, 7-day-a-week contact person. In order to provide timely advice, a spill response team has been established to address issues related to chemistry, tidal marshes, submerged aquatic vegetation, beaches, benthos, finfish, and water motions. Serves as the Virginia Emergency Operations Center's (VAEOC) primary point of contact at VIMS/SMS. Develops and maintains the master listing of spill response team personnel. Serves as the VAEOC's secondary point of contact at VIMS/SMS in addition to participating in initiatives to ensure continued Commonwealth capability to respond to oil and hazardous materials incidents. Serves as the VIMS/SMS Emergency Response Coordinator (ERC) for all oil and hazardous material spills within the VIMS/SMS geographical areas of responsibility. Provides technical and on-scene assistance as required in response to requests for mutual assistance from local and other state agencies. Maintains response cost documentation for use in recovery actions. When a spill is discovered, the Virginia Emergency Operations Center (VAEOC) and the State Water Control Board (SWCB) should be notified immediately. The VAEOC has the responsibility to report the spill to the National Response Center (NRC) and to notify the appropriate EPA and USCG On-Scene Coordinator (OSC) and the state Department of Emergency Services (DES) Regional Response Team (RRT). A combination of aerial surveillance and surface-level observations usually are necessary to obtain a clear understanding of the nature and extent of a given spill. Observers should be trained in the art of aerial surveillance to provide the most accurate results. Note that spilled oil may sink if it has a high specific gravity or if it has accumulated a large amount of sediment. All surveillance should be recorded on a map of the spill area, showing the complete flight path, direction and altitude, as well as the observations. All flight observations should be recorded in the same way to facilitate comparisons with time. The trajectory of a spill on the water surface can be estimated by vector addition of the water current and 3 % of the wind velocity. Maps which indicate environmentally sensitive areas which may be impacted if the spill continues on the forecast trajectory also will be needed. The Pollution Spill Trajectory Forecasting Service at the NRC can provide assistance in estimating the initial trajectory of the spill. Possible safety hazards include explosive or flammable vapors, presence of hydrogen sulfide, and possible other human hazards due to hydrocarbon vapors. Response and testing evolutions must remain consistent with entry level personnel protective capability. Other decisions to be made during the development of a countermeasure plan include the safety of manning and operating skimming equipment in rough seas or industrial hygiene requirements associated with the handling of chemicals. Thickness may best be obtained by direct measurement or by calculation from spill volume and area covered. If the oil layer is very thin (less than about 0.002 mm) and the viewing conditions are good, then oil thickness can sometimes be estimated from the presence of interference tints and rainbows. If the oil thickness is greater than 0.002 mm, the color is usually brown or black, thus, visual estimation of oil layer thickness is not possible for thicknesses over about 0.002 mm. The effectiveness of mechanical equipment diminishes with increasing sea state. Most equipment in use today is incapable recovering spilled oil effectively in seas which are more active than sea state 3, which is characterized by wind speeds up to knots and wave heights up to 4 feet. When considering mechanical equipment options, the relationship between the size of the spill and the availability of equipment should be determined. It is possible that a spill can be too large to contain or recover with available mechanical equipment, or that excessive time will be required to cover the spill area adequately due to the slow speed and low oil-encounter rate of most skimmers. In addition, the recovered oil must be transferred, stored, and disposed of. Also, the possible impact of using mechanical equipment in easily damaged, sensitive areas must be considered. The following three tables provide information on mechanical methods which can be used to contain a spill. Boom is deployed across or around sensitive areas and anchored in place. Approaching oil is deflected or contained by boom. Minor disturbance to substrate at shoreline points. Diversion Booming Boom is deployed at an angle to the approaching slick. Oil is diverted away from the sensitive area or to a less sensitive area for recovery. Minor disturbance to substrate at shoreline anchor points, heavy shoreline oil contaminant on downstream side. Containment Booming Boom is deployed in a "U" shape in front of the oncoming slick. The ends of the boom are anchored by drogues or work boats. Oil is contained within "U." No effect on open water, minor disturbance to substrate on inland anchor points. Sorbent Booming Boom is anchored along shoreline or used in one of the above techniques to protect sensitive areas and absorb oil. Minor disturbance to shoreline at anchor points. 2. Entrance to bay, harbor, lagoon, etc. at an angle in entrance or inside of entrance where water currents diminish. containment booming of slick outside entrance. 1 knot, use exclusion booming across entrance. inside of entrance where water currents diminish. Current > 1 knot Use diversion booming at an angle across channel. NOTE: Underflow dams can also be used in small streams. Subpart H of the National Contingency Plan (49 F.R. 29192, July 18, 1984, updated November 20, 1985) authorizes the On-Scene Coordinator to use dispersants on oil discharges if the dispersants are on the National Contingency Plan Product Schedule (EPA's current list of products for which data have been previously submitted and accepted by the agency) and if there is concurrence of the EPA representative to the Regional Response Team and the affected state(s). The decision to use dispersants may involve trade-offs between any environmental effects of the dispersed oil and the known damage which can be caused by the stranding of oil. A copy of the NCP Product Schedule is available from all EPA regional offices, all Coast Guard district offices, each member of the National Response Team, and the NRC duty officer. The VIMS/SMS Office of Safety and Environmental Programs will maintain a limited quantity of absorbent pads, dry absorbent, open top drums, and a drum/tank patching kit. In addition, the 75 foot long, 18 inch high oil containment boom stored at the VIMS/SMS marina can be deployed if not required in support of VIMS/SMS operations. Provide training to ensure effective execution of the CVEOP in general and assigned responsibilities in particular. The Director for Safety and Environmental Programs has been designated as the Virginia Institute of Marine Science/School of Marine Science (VIMS/SMS) Emergency Response Coordinator. Provide boat transportation over tidal waters for personnel and/or cargo. Assist the Marine Resources Commission in the assessing of damages to marine resources. Execute the provisions of the CVEOP and ensure evacuation of VIMS/SMS (including Wachapreague, if required) when directed to do by executive order or notification of such order by the Department of Emergency Services Emergency Operations Center. Activate the VIMS/SMS Emergency Operations Center in Clayton Annex. Assemble designated emergency response staff. Designate post disaster shore party personnel to carry out the tasking of the CVEOP. Direct relocation of VIMS/SMS vessels as required. Establish liaison with state and county emergency services personnel. Conduct walk through of VIMS/SMS checking for material which may present a danger to personnel and windows if blown about by high winds. Assist with preparation of emergency support services as required. Direct assigned personnel in boarding, taping, filling of sand bags, securing of grounds and equipment, etc. to minimize wind and water damage where possible. Designate appropriate personnel to ensure continued electrical and water service from VIMS/SMS emergency supply sources. Designate heavy equipment operators for emergency clearing work and post-disaster clean up. All applicable federal, state, and local emergency plans are kept at the Office of Safety and Environmental Programs in Clayton Annex. The Emergency Response Coordinator is responsible for maintaining their currency. The plans are available for review during normal working hours. It is the general policy of the Virginia Institute of Marine Science, School of Marine Science of the College of William & Mary that the Institute be operated in a safe manner. The occurrence of severe storms or of snow or ice storms may require various actions including changes to the normal, daily operating procedures and, possibly, closing the campus or delaying opening. The following sections of this document list and describe some of those actions. Although officially a part of the College of William & Mary, the VIMS campuses at Gloucester Point and Wachapreague are likely to experience storm conditions different from one another and from those in Williamsburg; hence the actions taken on each campus, including closing, are to be made by the senior officials on each campus and the decisions communicated to the Dean and Director of VIMS/SMS and the Provost of the College, as appropriate. Meetings of the Storm Planning Group will be called by the Dean and Director. The Executive Assistant to the Director will establish the place for the meeting and will contact the members of the group. In the absence of any member of the Storm Planning Group, a pre-designated person or someone selected at the time may sit in place of the absent member, provide input, and take assigned or appropriate actions except that an alternate may not replace the primary officer in the "Chain-of-Command" for Storm Planning or Response activities. National Weather Service posts a Hurricane or Tropical Storm Watch or the Dean and Director determines that this level of action is necessary. If at all possible, communications at this level should be "first person," that is either face-to-face or direct telephone. E-mail, voice mail, and fax communications lack a certainty of receipt. because of the storm and that they should make specific plans for leaving campus. might be exposed to the storm. being taken at the Wachapreague Campus. actions planned to safeguard ITNS assets. 1: Issues firmer planning e-mail. Where possible all one-to-one contacts or communications at this level will be "first person," that is face to face or telephone; e-mail, voice mail, and fax communications are not appropriate unless receipt is verified promptly. 1: Carry out work listed in the attached "Hurricane Preparedness Checklist." have to vacate those facilities and go either to a private home or public shelter. work area including dive locker. materials at a safe elevation above the floor in case of flooding. 3: Directs the Hatchery to secure operations as necessary and verifies. appropriate actions have been taken. to prohibit the introduction of foreign species into local waters. interrupted, or other persons designated by the Dean and Director should be on campus. Programs to distribute that information to the media. the Dean and Director may request that faculty, staff, and students be mobilized. 1: Assess damage and arrange for repairs. 3: Review "Hurricane Preparedness Checklist" and return facilities to their normal conditions. The primary hazards of winter storms are losses of electricity and telephone and the presence of snow or ice. Thus the Dean and Director might decide that a meeting of the full Storm Planning Group is not necessary. Also, advance warning of snow and ice storms tends be less formal than for tropical storms or hurricanes. the readiness of campus to reopen. Following the meeting of the Storm Planning Group, the Manager of Administrative Services should be directed to prepare a memo for general distribution under the Dean and Director's authority listing the media that will carry closing announcements, reminding all to check voice-mail and e-mail from home for messages, and stating that if the Institute is closed or during the period of a delayed opening, only "essential" personnel should be on campus because the presence of cars in the parking lots hinders snow removal and because of questionable safety until snow is removed or ice is sanded. The Director of Facilities Management should establish a business relationship with a plowing contractor as early in the season as possible to assure that the Institute's parking lots and roads are cleared as soon as possible. If there is a forecast of snow or ice fall over night, the Storm Planning Group should meet in the early afternoon to determine a course of action. If snow begins during the day the Storm Planning Group should meet soon after the snow begins to determine if the Institute should close early. If there is an overnight snow or icefall such that the Institute might be closed, the decision needs to be made before 6:00 a.m. so that the media can be notified. In general, the Director of Facilities Management or the Director for Safety and Environmental Programs will telephone the Dean and Director at 5:45 a.m. to decide whether to open the Institute at the usual time, delay opening, or close the Institute for the day. After making this decision, the Dean and Director will telephone the Manager of Administrative Services or the Associate Director for Safety and Environmental Programs who in turn will notify the media, place an all extensions voice mail, and, if possible, an "everyone" e-mail. The Dean and Director will notify the Provost as appropriate. The Director of Facilities Management will implement appropriate actions to assure the prompt and timely removal of snow from parking lots and walkways and the sanding of icy or slippery exterior walkways and stairs. The Eastern Shore Facility will develop independent procedures. The Director of Eastern Shore Laboratory will notify the Dean and Director of any decisions to close or delay opening the Eastern Shore Facility. Call the maintenance supervisor at the Eastern Shore Laboratory to see if he needs any assistance from the Gloucester Point campus. Check the generators and top-off fuel tanks. Housekeeping makes plastic trash bags available to cover computers and other desktop electronics and notifies the VIMS community of their availability via e-mail. Have the maintenance, groundskeeping, and housekeeping crews patrol the campus and move lawn furniture (i.e. Furniture on the Page House deck) indoors or lash the heavier items such as picnic tables to some immovable objects. 1. Check with Department Heads to determine which experiments need uninterrupted power and assist scientific staff in moving the contents from ultra-low temperatures freezers not on uninterrupted power supplies to those on uninterrupted power supplies in Chesapeake Bay Hall or move movable freezers to uninterrupted power supplies in CBH. 2. Place a mobile emergency generator in service at the oyster hatchery. 4. Move all pool vehicles from low-lying areas to higher ground. 5. Secure Triangle Parking Lot as a site for Vessels Operations to bring trailerable boats and similar equipment. 1. Turn off the valves on the propane tanks in the boat basin and other low lying areas. 2. Connect the air pump for the fish tanks in Byrd Hall to an electric circuit served by the emergency generator in the Gem Lab (or elsewhere). 3. Check that all sprinkler control valves are in the open position. 4. Board up the windows at Watermen's Hall Library. 5. At some point during the storm we may be shut out of the HRSD force main. Be prepared either to pump the wet well using a septic service with a tanker or close the Institute. Consider shutting down the water-cooled pump in CBH to conserve wastewater. Place sandbags at the east doors to the atrium of CBH and the exterior doors in the service area of the Nunnally Hall - Fisheries Science Building. Turn off lawn irrigation system. Depending upon the anticipated severity of the storm, shut off electrical power to buildings at the main distribution panels, shut off domestic water service, shut off propane supplies as appropriate. 10. Move a full set of vehicle and building master keys to Clayton Annex. Following the storm it will be necessary to reuse this checklist and return items to their "normal" conditions.